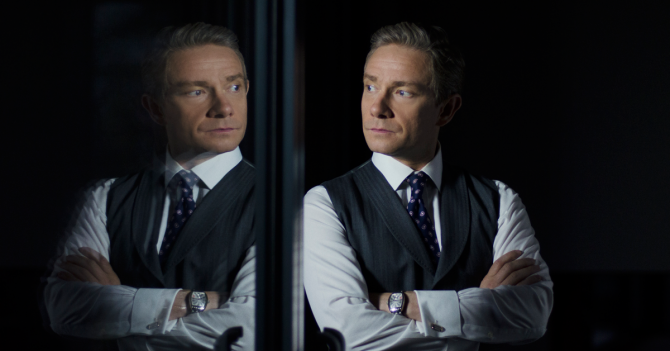 If catching him as Everett Ross in Marvel’s Black Panther wasn’t enough for fans of the Sherlock and Hobbit actor, Martin Freeman is now set to scare us out of our wits as well in the upcoming British horror anthology movie, Ghost Stories. Co-written, co-directed by and co-starring Andy Nyman, the film will combine three tales of terror via a wraparound narrative, featuring Nyman as a skeptic psychologist investigating ghost sightings. From there, we imagine his character will have his disbelief tested when he comes face to face with the supernatural. Martin Freeman nabs top billing, of course, and is set to play a man named Mike Priddle, while the rest of the cast is filled out with comedian Paul Whitehouse, Alex Lawther (The Imitation Game) and Jill Halfpenny. Unfortunately, the fan favorite actor doesn’t show up in this new clip (up above), but rest assured, he is in the film and if you’re curious to know more, you can consult the plot summary below. Those who like their horror with a distinctly British tinge and a strain of jet-black humour will surely want to check this one out. Fans of the horror-comedy genre will also note that Ghost Stories is co-written and co-directed by Jeremy Dyson, most well known for being part of dark comedy quartet The League of Gentlemen. All things considered, then, this is definitely a film to put on your radar. And guess what? It won’t even have to stay on there for that long, as Ghost Stories is set to arrive in theaters and on VOD this Friday, April 20th, and with an 85% rating on Rotten Tomatoes already, you’d be wise to give it a watch.